Amidst recent national disasters including hurricanes and earthquakes across the nation and internationally, many may be asking the question of why God allows evil. Professor of Christian apologetics Clay Jones recently published a book answering that exact question. The book “Why Does God Allow Evil? 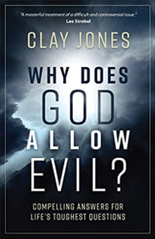 : Compelling Answers for Life’s Toughest Questions,” examines what Scripture states about the nature of evil and why God allows it — a question Christians and non-Christians alike struggle with, according to Jones. “If you are looking for one book to make sense of the problem of evil, this book is for you,” wrote Biola professor of Christian apologetics Sean McDowell in an endorsement for the book. In addition, Jones aims to help readers discover the contrasting abundance of God's grace, the overwhelming joy of heaven, and the extraordinary destiny of believers. Jones is an associate professor of Christian apologetics at Biola University and the chairman of the board for Ratio Christi, an international university apologetics ministry. Previously he hosted the nationally syndicated talk radio program Contend for Truth and served on the pastoral staff of two large churches. “Why Does God Allow Evil? : Compelling Answers for Life’s Toughest Questions” is available for purchase on Amazon. Learn more about Biola’s master’s degree in Christian Apologetics online. Written by Jenna Loumagne, manager of media relations. Contact Jenna at (562) 777-4061 or jenna.loumagne@biola.edu.